There are some tricks with which you can increase durability of your tyre and make it more puncture proof from sharp objects such as wood, glass, pins and even nails. One way is to upgrade your wheels with tubeless tyres which can be filled with sealant that will prevent air from exiting. The other way is to try the experiment that Oliver Bridgewood made along with an interesting video about handling that issue. Many wheel and tyre companies are pushing tubeless tyres and wheels at the moment. For those who don’t know, tubeless tyres are similar to a clincher, but form an air-tight seal against the rim and contain sealant, instead of an inner tube. We previously did an experiment to see if a tubeless road tyre could survive a nail being hammered into the carcass. The result was that it can seal and is very impressive. Further to that we’ve tubeless tyres through the winter on the road and remain very impressed. This got us thinking. What would happen if you put tubeless sealant inside a standard inner tube and then put it in a normal clincher tyre set up on your existing wheels? Would it work and would it still seal punctures? 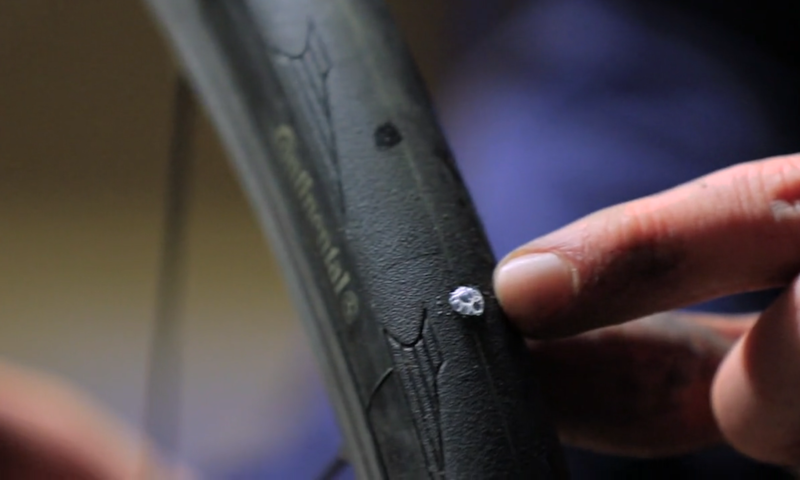 The experiment showed that tubeless tyres can endure extreme nail punctures such as rolling the wheel over drawing pins and direct nail hammering. Although those kind of punctures are rarely possible during rides (especially direct nail puncture), sealant can fill holes in very short time without loosing much air pressure. It is interesting that you can fill regular inner tubes with sealant by removing valve pin. Test surprisingly showed that they can almost evenly endure such puncture damage as tubeless tyres. If you want to maximize tyre durability and protection from any damage, especially punctures, it would be a good idea to use tubeless tyres. Downside is that they are more expensive then regular ones and they often require special wheel for installation or they are tricky to put on wheels. Cheaper way is to use normal tyres previously filled with sealant. They are easy to install, but they have more rotational weight what will slightly make the climbing and sprinting harder. You can read more about the whole experiment here.